One Live Coral Bells "Palace Purple" Plant Shipped in a 3.5 Inch Square Pot. Botanical Name: Heuchera micrantha Great For Rock Gardens. Bloom Time and Color: Pinkish-White blooms in late spring to mid fall. Blooms repeatedly. 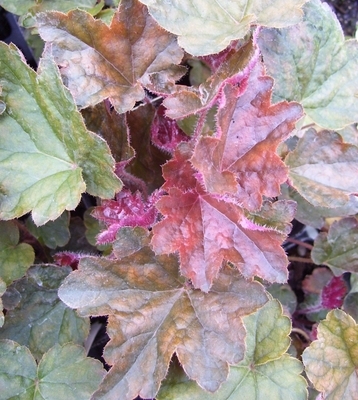 Description: Palace Purple is one of the most popular Coral Bells on the market. Perennial of the year in 1991. Unique deep purple foliage, fading to bronzy green in hot summers and dark red stems, make it a little different than the rest. The plant grows to a height of 12-18 inches and a spread of 10-15 inches. Looks especially good growing around the edge of borders, near variegated plants, woodland edges, rock gardens, perennial borders, or in masses to form an attractive ground cover.